With the development of photovoltaic technology, we have witnessed the rapid growth of perovskite solar cells/modules . With certified efficiency over 22%, perovskite solar cells are approaching crystalline silicon solar cells and are comparable to other commercialized thin film solar photovoltaic technology, like CdTe and CIGS. At the current research stage, however, further improvements are still needed in mainly following aspects, lifetime and scalable production. This first challenge is to understand the stress factors and stress levels for degradation mechanisms, which is helpful for the materials/device design that reach industrial standards. And the second one will be the development of protocols to make such a technology applicable to industrial-scale. After electricity generation, the storage of the energy for designated usage should be considered, since the energy conversion is only under sunlight. Energy storage systems (e.g., batteries) play an equal important role in the development of photovoltaic technology. The development of these aspects constitute the backbone for the research in the EMSS Unit. In this year, we co-organized 2016 MRS Fall Meeting (Symposium ES3 : Perovskite Solar Cell Research from Material Properties to Photovoltaic Function). During the 5 days symposium, we presented our research progress in the understanding of the stress factors that limited the perovsktie solar cells operational lifetime and the protocols the up-scale this technology to industrial-scale. Organic-inorganic perovskite fabrication by the anti-solvent method. 3.1 Study of degradation mechanisms for perovskite materials and devices. Shenghao Wang, Yan Jiang, Emilio J. Juarez-Perez, Luis K. Ono, and Yabing Qi*, "Accelerated degradation of methylammonium lead iodide perovskites induced by exposure to iodine vapour". Nature Energy 2, 16195 (2016). Emilio J. Juarez-Perez, Zafer Hawash, Sonia R. Raga, Luis K. Ono, Yabing Qi*, "Thermal degradation of CH3NH3PbI3 perovskite into NH3 and CH3I gases observed by coupled thermogravimetry - mass spectrometry analysis". Energy Environ. Sci. 9, 3406-3410 (2016). In the past few years, we have all witnessed the unprecedented zeal for the rapid growth of the organometal halide perovskite solar cell field. The tremendous efforts devoted to device fabrication and optimization have led to PCEs exceeding 20%, which gives perovskite solar cells a competitive advantage over many other well-known solar technologies. On the other hand, some challenges remain with the lifetime as the key. At present, even the most long-lasting perovskite solar cells can only retain stable PCEs up to a few thousands of hours, which is way behind, for example, silicon cells. To further improve perovskite solar cells, we must overcome/mitigate the degradation issue. For this reason, a thorough detailed understanding of perovskite solar cell degradation processes becomes an imperative first step. Figure 1: Top scheme shows that a PSC is exposed to air (that is, moisture and oxygen), light illumination, and an electric field during operation, leading to initial degradation of the perovskite layer and generation of I2 (indicated by paired purple spheres without a tail) as a product. Simultaneously, the perovskite layer is self-exposed to I2 vapour (indicated by paired purple spheres with tails) because of the high vapour pressure of I2. 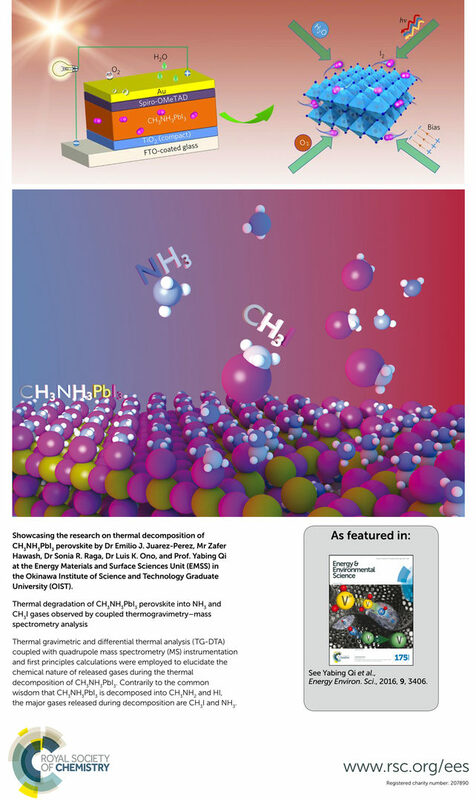 (Bottom cover page) Showcasing the research on thermal decomposition of CH3NH3PbI3 perovskite. 3.2 Review paper on surface and interface aspects of perovskite materials and solar cells. Luis K. Ono, Yabing Qi*, "Surface and Interface Aspects of Organometal Halide Perovskite Materials and Solar Cells" J. Phys. Chem. Lett. 7, 4764-4794 (2016). The current challenges (e.g., stability, hysteresis, etc.) in organometal halide perovskite solar cell research are closely correlated with surfaces and interfaces. For instance, efficient generation of charges, extraction, and transport with minimum recombination through interlayer interfaces is crucial to attain high-efficiency solar cell devices. Furthermore, intralayer interfaces may be present in the form of grain boundaries within a film composed of the same material, for example, a polycrystalline perovskite layer. The adjacent grains may assume different crystal orientations and/or have different chemical compositions, which impacts charge excitation and dynamics and thereby the overall solar cell performance. 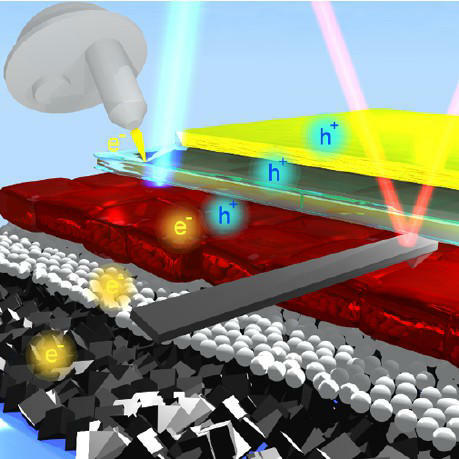 In this Perspective, we present case studies to demonstrate (1) how surfaces and interfaces can impact material properties and device performance and (2) how these issues can be investigated by surface science techniques, such as scanning probe microscopy, photoelectron spectroscopy, and so forth. We end this Perspective by outlining the future research directions based on the reported results as well as the new trends in the field. Figure 2: Showcasing the surfaces and interfaces that inside perovskite solar cell devices and how these issues can be investigated by surface science techniques. 3.3 Morphology and properties of spiro-MeOTAD hole transport materials. Zafer Hawash, Luis K. Ono, and Yabing Qi*, "Moisture and Oxygen Enhance Conductivity of LiTFSI-Doped Spiro-MeOTAD Hole Transport Layer in Perovskite Solar Cells". Adv. Mater. Interfaces 3, 1600117 (2016). Emilio J. Juarez-Perez, Matthew R. Leyden, Shenghao Wang, Luis K. Ono, Zafer Hawash, and Yabing Qi*, "Role of the Dopants on the Morphological and Transport Properties of Spiro-MeOTAD Hole Transport Layer". Chem. Mater. 28, 5702–5709 (2016). The use of a solid hole transport layer (HTL) was transformational for the recent perovskite solar cell (PSC) revolution in solar energy technology. Often high efficiency PSC devices employ heavily doped hole transport materials such as spiro-MeOTAD. Independent of HTL chemistry, lithium-bis-trifluoromethanesulfonyl-imide (LiTFSI) and tert-butylpyridine (TBP) are commonly used as additives in HTL formulations for PSCs. LiTFSI and TBP were originally optimized for dye-sensitized solar cells, where their roles have been extensively studied. However, in the case of PSCs, the function of TBP is not clearly understood. In this study, properties of the HTL composite deposited on flat silicon substrates were systematically measured at several length scales, e.g., macroscopically (profilometry, 4-point probe conductivity, and thermogravimetry-differential thermal analysis), microscopically, and at the nanoscale to investigate film morphology, conductivity, and dopant distribution. Microscopic distributions of spiro-MeOTAD, LiTFSI, and TBP were determined using 2D Fourier transform infrared (FTIR) microscopy and electrostatic atomic force microscopy (EFM). Our findings reveal that the main role of TBP is to prevent phase segregation of LiTFSI and spiro-MeOTAD, resulting in a homogeneous hole transport layer. These properties are critical for charge transport in the HTL bulk film as well as at the perovskite/HTL and HTL/electrode interfaces and for efficient solar cell performance. 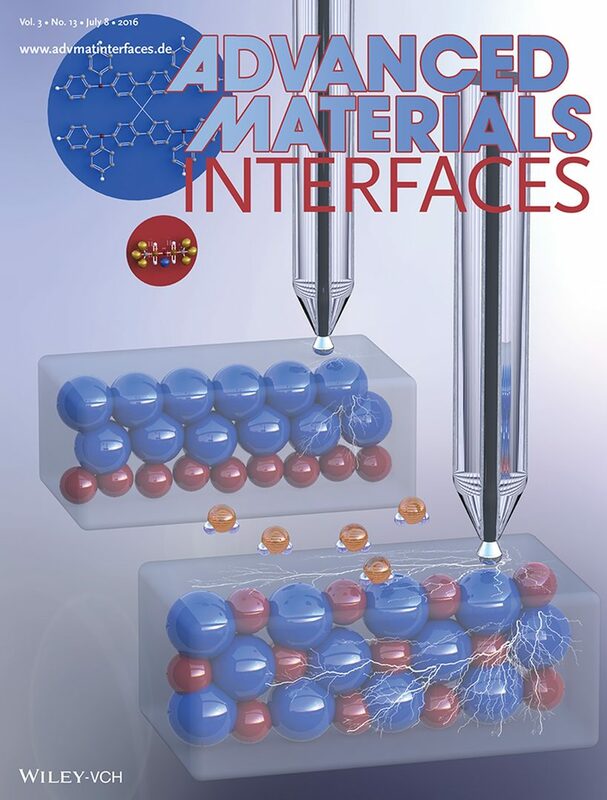 Moisture is necessary to enhance the conductivity of LiTFSI‐doped, hole transport layers. Photoemission spectroscopy (PES) and Hg‐drop current–voltage measurements are used to study the effects of H2O vapor, dry O2, and ambient air on Li‐bis(trifluoromethanesulfonyl)‐imide (LiTFSI)‐doped, spiro‐MeOTAD. PES shows that humidity is the component of air that causes LiTFSI dopants to redistribute across spiro‐MeOTAD films, leading to an enhanced conductivity. Figure 3: Mercury drop electrode current‐voltage measurements reveal that moisture in ambient air causes Li‐bis(trifluoromethanesulfonyl)‐imide dopants to re‐distribute across spiro‐MeOTAD hole transport layer in perovskite solar cells, thereby significantly improving hole transport properties. These findings suggest that moisture‐induced dopant redistribution is most likely the major cause responsible for the efficiency enhancement in perovskite solar cells when exposed to ambient air for several hours after fabrication, a common practice in the field. 3.4 Protocols for scalable fabrication of perovskite solar cells/modules. Matthew R. Leyden, Yan Jiang, and Yabing Qi*, "Chemical vapor deposition grown formamidinium perovskite solar modules with high steady state power and thermal stability". J. Mater. Chem. A 4, 16195 (2016). Mikas Remeika, Sonia R. Raga, Shijin Zhang, and Yabing Qi*, "Transferrable Optimization of Spray-Coated PbI2 Films for Perovskite Solar Cell Fabrication". J. Mater. Chem. A 5, 5709-5718 (2017). In this study, we explored the protocols towards scalable fabrication of perovskite solar cells/modules. Metal organic halide perovskites are promising materials for solar cells with a maximum certified efficiency of 22.1%. However, there are only a handful of reports on larger area modules, where efficiencies drop with increasing use of the active area. Chemical vapor deposition (CVD) is a technology used in many industrial applications demonstrating potential for scale up. We used a CVD process to fabricate MAPbI3 and FAPbI3 based solar cells with power conversion efficiencies (PCEs) up to 15.6% (MAI, 0.09 cm2) and 5 x 5 cm modules with 9.5% (FAI, 5-cell modules, total active area 8.8 cm2) and 9.0% (FAI, 6-cell modules, total active area 12 cm2). Ultrasonic spray coating is a promising pathway to scaling-up of perovskite solar cell production that can be implemented on any scale – from table-top to mass production. Device fabrication based on the optimized process is demonstrated under ambient conditions with a relative humidity of 50%, achieving a power conversion efficiency of 13% in 1 cm2 area devices, with negligible hysteresis. 3.5 Methyl-amine gas-induced crystallization improvement for perovskite solar cells. 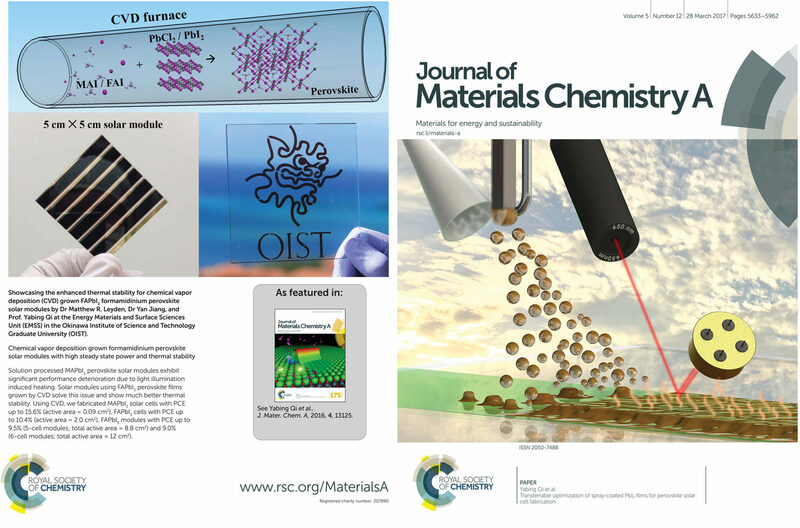 Yan Jiang, Emilio J. Juarez-Perez, Qianqing Ge, Shenghao Wang, Matthew R. Leyden, Luis, K. Ono, Sonia R. Raga, Jinsong Hu, and Yabing Qi*, “Post-annealing of MAPbI3 perovskite films with methylamine for efficient perovskite solar cells”, Mater. Horiz. 3, 548-555 (2016). Methylamine post-annealing solves the grain boundary-related issues and suppresses both inter- and intra-layer carrier recombination in MAPbI3 perovskite films. Both planar and meso-structured perovskite solar cells with methylamine post-annealing show better performance and stability compared to other post-annealing treatments. Figure 5: Showcasing the enhanced performance and stability of perovskite solar cells by methylamine post-annealing. Mikas Remeika, Sonia R. Raga, Shijin Zhang, and Yabing Qi*, "Transferrable Optimization of Spray-Coated PbI2 Films for Perovskite Solar Cell Fabrication" J. Mater. Chem. A 5, 5709-5718 (2017). Shenghao Wang, Yan Jiang, Emilio J. Juarez-Perez, Luis K. Ono, and Yabing Qi*, "Accelerated degradation of methylammonium lead iodide perovskites induced by exposure to iodine vapour" Nature Energy 2, 16195 (2016). 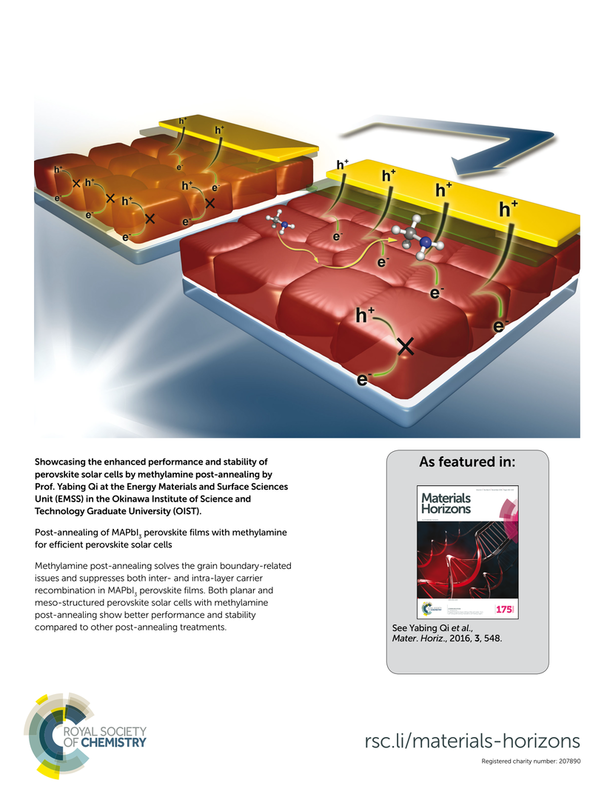 Sonia R. Raga and Yabing Qi*, "The Effect of Impurities on the Impedance Spectroscopy Response of CH3NH3PbI3 Perovskite Solar Cells" J. Phys. Chem. C 120, 28519–28526 (2016). Emilio J. Juarez-Perez, Zafer Hawash, Sonia R. Raga, Luis K. Ono, Yabing Qi*, "Thermal degradation of CH3NH3PbI3 perovskite into NH3 and CH3I gases observed by coupled thermogravimetry - mass spectrometry analysis" Energy Environ. Sci. 9, 3406 - 3410 (2016). 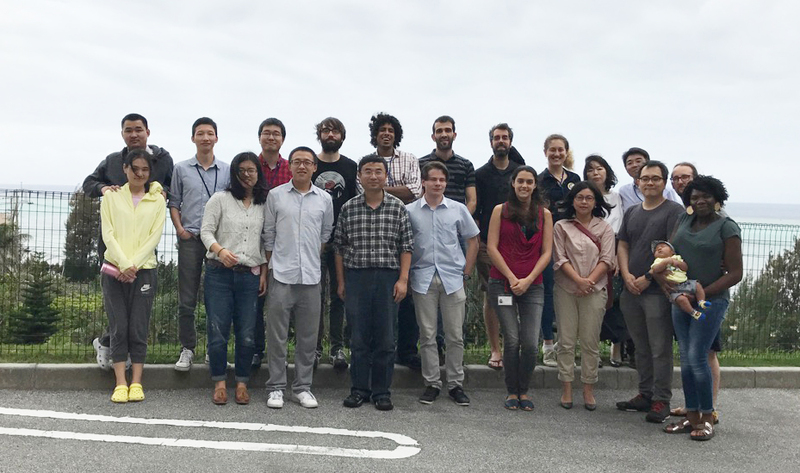 Yan Jiang, Emilio José Juarez-Perez, Qian-Qing Ge, Shenghao Wang, Matthew R. Leyden, Luis K. Ono, Sonia R. Raga, Jin-Song Hu, Yabing Qi*, "Post-annealing of MAPbI3 perovskite films with methylamine for efficient perovskite solar cells" Mater. Horiz. 3, 548 - 555 (2016). Michael V. Lee, Sonia R. Raga, Yuichi Kato, Matthew R. Leyden, Luis K. Ono, Shenghao Wang, Yabing Qi*, "Transamidation of dimethylformamide during alkylammonium lead triiodide film formation for perovskite solar cells" Journal of Materials Research (2016) DOI: http://dx.doi.org/10.1557/jmr.2016.272. Emilio J. Juarez-Perez, Matthew R. Leyden, Shenghao Wang, Luis K. Ono, Zafer Hawash, Yabing Qi*, "Role of the Dopants on the Morphological and Transport Properties of Spiro-MeOTAD Hole Transport Layer" Chem. Mater. 28, 5702 - 5709 (2016). Matthew R. Leyden, Yan Jiang, Yabing Qi*, "Chemical vapor deposition grown formamidinium perovskite solar modules with high steady state power and thermal stability", J. Mater. Chem. A 4, 13125 - 13132 (2016). Zafer Hawash, Luis K. Ono, Yabing Qi*, "Moisture and Oxygen Enhance Conductivity of LiTFSI-Doped Spiro-MeOTAD Hole Transport Layer in Perovskite Solar Cells" Adv. Mater. Interfaces 3, 1600117 (2016). Z. Hawash, L.K. Ono, and Y.B. Qi*, “The Effects of Ambient Exposure on Charge Transport Properties of LiTFSI Doped Spiro-MeOTAD Hole Transport Layers in Perovskite Solar Cells.”, 2016 MRS Fall Meeting & Exhibit, Boston, Massachusetts (November 28-December 2, 2016). M. Leyden, Y.B. Qi*, and Y. Jiang “Chemical Vapor Deposition Grown Formamidinium Perovskite Solar Modules with High Steady State Power.”, 2016 MRS Fall Meeting & Exhibit, Boston, Massachusetts (November 28-December 2, 2016). M. Remeika, S.R. Raga, S. Zhang and Y.B. Qi*, “Quantitative Characterization of Ultrasonic Spray Coating of PbI2 for Perovskite Solar Cell Fabrication.”, The International Conference Asia-Pacific Hybrid and Organic Photovoltaics (AP-HOPV17), Yokohama-shi, Japan (February 2-4, 2017). S.R. Raga, L.K. Ono and Y.B. Qi*, “Rapid CH3NH3PbI3 Formation by MethylAmine Gas-Induced Reaction and its Characterization by Impedance Spectroscopy.”, The International Conference Asia-Pacific Hybrid and Organic Photovoltaics (AP-HOPV17), Yokohama-shi, Japan (February 2-4, 2017). Z. Hawash, L.K. Ono, S.R. Raga, M.V. Lee and Y.B. Qi*, “Enhancement of Electrical and Electronic Properties of LiTFSI Doped Spiro-MeOTAD Hole Transport Layer upon Di−erent Environmental Conditions.”, The International Conference Asia-Pacific Hybrid and Organic Photovoltaics (AP-HOPV17), Yokohama-shi, Japan (February 2-4, 2017). R. Ohmann, L.K. Ono, H.-S. Kim, H. Lin, M.V. Lee, Y. Li, N.-G. Park and Y.B. Qi*, “Atomic Structure of Single Crystal Organic-Inorganic Perovskite Surface.”, The International Conference Asia-Pacific Hybrid and Organic Photovoltaics (AP-HOPV17), Yokohama-shi, Japan (February 2-4, 2017). Yabing Qi, Luis K. Ono, US provisional patent application “A Method of Patterning” (2016). Yabing Qi, Luis K. Ono, Mikas Remeika, Sonia Ruiz-Raga, US provisional patent application “Automated Comprehensive Performance Assessment System” (2016). Speaker: Prof. Yun Lai, Professor and the Associate Dean in the School of Physical Science and Technology in Soochow University in Suzhou, China. Speaker: Prof. Feng Yan, Department of Applied Physics of the Hong Kong Polytechnic University, China. Title: Photovoltaic Devices with Advanced Nanotechnology. Speaker: Prof. Tong-Yi Zhang, Shanghai University, China. Title: Solubility and Internal Stress in Nanograined Materials and Nanoparticles. Speaker: Prof. Mingdeng Wei, Fuzhou University, China. Title: Titanates and Their Derivatives: New Electrode Materials for Energy Conversion and Storage. Speaker: Prof. Takeaki Sakurai, Tsukuba University, Japan. Title: Crystalline defects in highly efficient widegap Cu(In,Ga)Se2 based solar cells. Speaker: Prof. Prashant Sonar, Queensland University of Technology Brisbane, Australia. Title: Molecular Engineering Approach for the Synthesis of π-Functional Organic Semiconductors and Organic Electronic Devices. Speaker: Dr. Michael Saliba, École polytechnique fédérale de Lausanne (EPFL), Switzerland. Title: Perovskite Photovoltaics – Opportunities and Challenges towards a Sustainable Energy Future. Speaker: Dr. Zonghao Liu, Department of Materials Science & Engineering at Peking University, China. Title: Interface Engineering towards High Efficiency Perovskite Solar Cells. Speaker: Prof. Masato Maitani, University of Tokyo, Japan. Title: Engineering of Semiconductor Energetics of Scaffolds in Perovskite Solar cells from Surface Chemical Point of View.